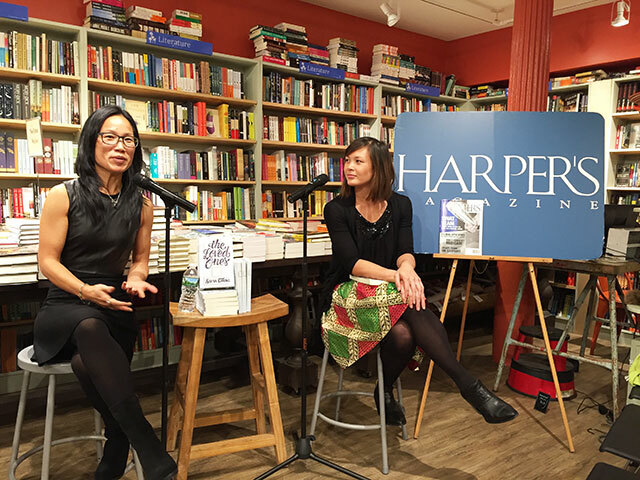 Sonya Chung was at BookCulture in Manhattan to discuss her novel The Loved Ones with Harper’s magazine editor Camille Bromley. The Loved Ones is Chung’s second novel published through independent press Relegation Books. The novel follows the story of two families named Lee. Charles Lee, the African American, middled-aged patriarch of a biracial family in Washington D.C. ends up befriending Korean American teenager Hannah Lee. Chung says she believes in the idea that you are and also you are not the culture of the family you come from. She says both her characters are working hard to not be be pre-determined but those expectations. In writing each of them, she wanted to know them as individuals. For instance, there are things about Charles about his past, but also plenty of things he doesn’t. Chung jokes that is sort of an American thing to go to therapy and talk about childhood and that is who you are — the problems and secrets revealed by analysis. Before The Loved Ones, Chung had been working on a different manuscript she hoped would become her second novel. It was a sprawling story and one she was unable to really connect with. That project never made it. She describes the realization as pretty devastating. On the other hand, Hannah Lee, a Korean-American living in Washington D.C. felt like something much closer to home and something Chung could tackle following the loss of the other project. In writing the novel, Chung decided to focus on the voice rather than on the plot. The novel is written in the close third person. She says when she started, she knew it felt like the perspective the story would best be told from. Chung’s debut novel, Long for this World was published through a big press, but Relegation Books, publisher of The Loved Ones is a relatively new, small independent press. Relegation was founded by Dallas Hudgens, who like Chung, had a debut with a big publisher. Hudgens founded Relegation books in order to publish a short story collection the larger presses didn’t want to buy. Selling a second novel can always be a particularly difficult challenge, Chung says, but even before she tried to shop around The Loved Ones, she was inclined towards smaller presses. Hudgens eventually read her manuscript and they both thought they would be a mutual good fit. Embracing the smaller presses is important. If you are any kind of creative person, Chung says, there will always be a mainstream and an anti-establishment. It won’t be the same for everyone, but Chung advises you should just do it.